New Brunswick is often thought of as a rural place, aided by the absence of a single large urban centre. This sets New Brunswick apart from the other three Atlantic provinces, all with one dominant city. Figures from the 2016 census suggest things may be changing. New Brunswick’s urbanization should force a reconsideration of its rural self-image. It is becoming a majority urban place, with implications for thinking about economic development efforts. The three metropolitan areas in New Brunswick are Moncton, Saint John, Fredericton and their respective suburban and rural hinterland — including people who may live in rural surroundings yet whose lives are very much tied to an urban centre. In 2016, these centres were home to 49.9 percent of the population, just shy of half. This compares to 42.5 percent in 1991. 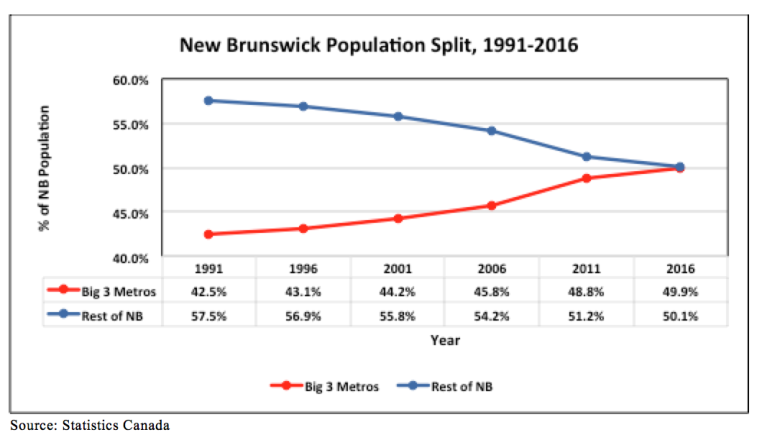 The raw population numbers further emphasize New Brunswick’s urban trajectory. Between 1991 and 2016, the population of the big three urban areas grew from 307,992 to 372,772, an increase of 21 percent. The rest of New Brunswick, meanwhile, saw its population decline from 415,908 to 374,329, a drop of 10 percent. New Brunswickers are increasingly moving to the big three urban areas, reflecting available job opportunities and greater convenience. Policy makers should not be distressed by this trend, for it reflects larger economic and historical forces that tend towards greater urbanization. What should strike them, however, is that urbanization proceeds despite costly, and ultimately failed, efforts to artificially prop up rural New Brunswick and its traditional economic activities. First, we must not view economic prosperity and growth in urban centres as restricted to said areas. Vibrant cities nurture demand for vibrant rural hinterlands that can provide desired products and services. Second, rural communities should be given greater control over their tax and spending powers. The Local Service District model of local governance that currently applies to over one-third of New Brunswickers is inefficient and stifles local initiative and experimentation in a host of areas, all ultimately tied to economic development. Rural areas must be given direct municipal control over their local matters. Third, the myriad forms of regional development and corporate welfare initiatives should cease, to be replaced by a broad tax and regulatory environment that encourages entrepreneurship and investment, such as eliminating the small business tax. Efforts to keep traditional industries alive should be scrapped. Just because a town has always depended on a given industry does not mean it must always do so in the future. Instead, government should let local and outside entrepreneurs and investors have the freedom to develop new economic drivers for rural areas, ones based on market needs, rather than political interference. Fourth, eliminate regulations that seem designed to kill entrepreneurial efforts in favour of established enterprises or government agencies. For instance, New Brunswick’s burgeoning craft brewing agency would do much better without archaic restrictions imposed by NB Liquor. In sum, the provincial government could abandon statist efforts to prop-up declining industries and instead create a better, and fairer environment for businesses to emerge and grow naturally. One can then expect prosperity and growth to flourish in both urban and rural areas alike.